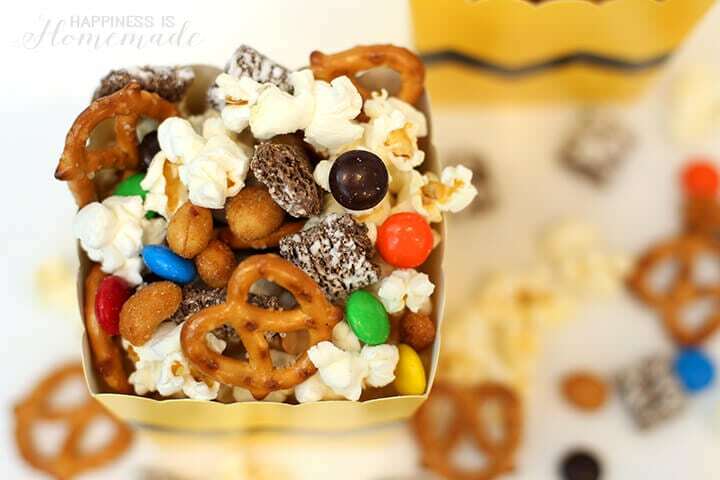 Make this quick & easy snack mix to celebrate the new Peanuts movie! 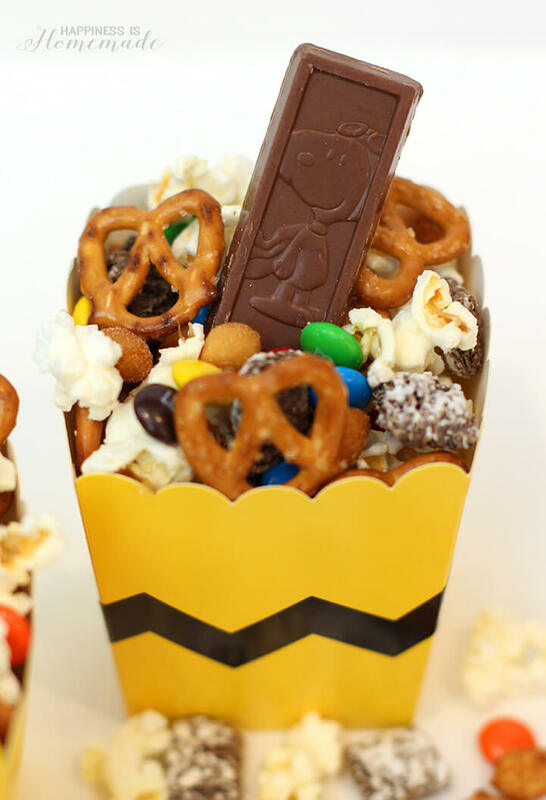 Popcorn, peanuts, pretzels and more with chocolate Peanuts characters on top! Trick or treat! 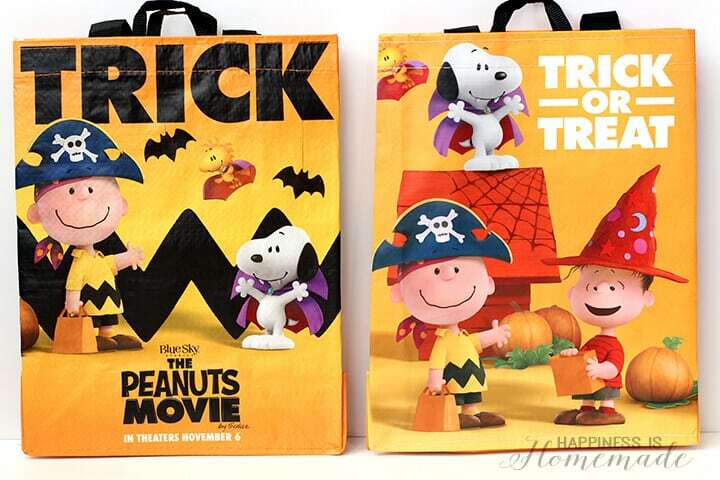 Our family is all ready for the big night with these adorable reusable FREE Peanuts movie trick or treat bags that we picked up at Safeway (free with the purchase of three participating brand items, while supplies last). My three boys can NOT wait until the Peanuts movie premieres on November 6th, and honestly, I’m super excited to see it, too! 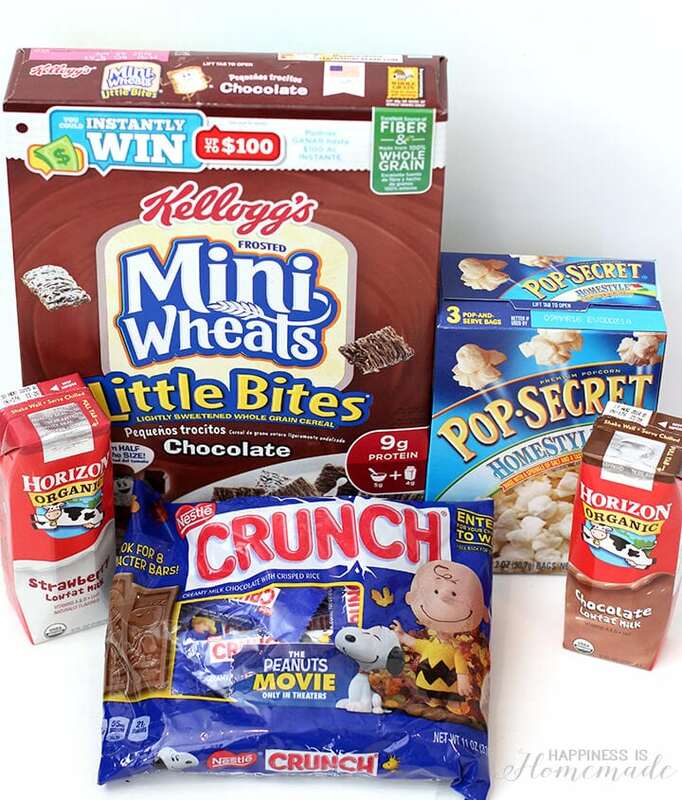 To earn our free trick or treat bags, we picked up a few products from our favorite brands that are participating in the trick or treat bag promotion – Kellogg’s, Horizon Organic, Nestle, and Pop Secret – to include in a special Peanuts movie snack mix [additional participating brands include Coke (Honest and Pure Leaf), Johnsonville, Ziploc, Johnson & Johnson, All, Tyson, Snack Pack (ConAgra), DPSG, Schwan’s (Red Baron’s), Rich Products (sugar cookies and cakes in the deli section), ACH Foods/Spice Islands and Bertolli/Ragu.]. 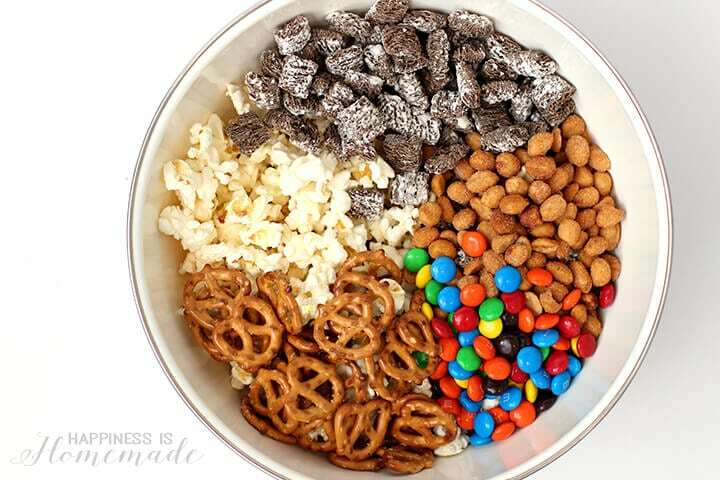 We mixed together the Pop Secret popcorn, Kellogg’s Chocolate Mini Wheats Little Bites cereal, mini pretzels, M&Ms, and honey roasted peanuts (of course!). 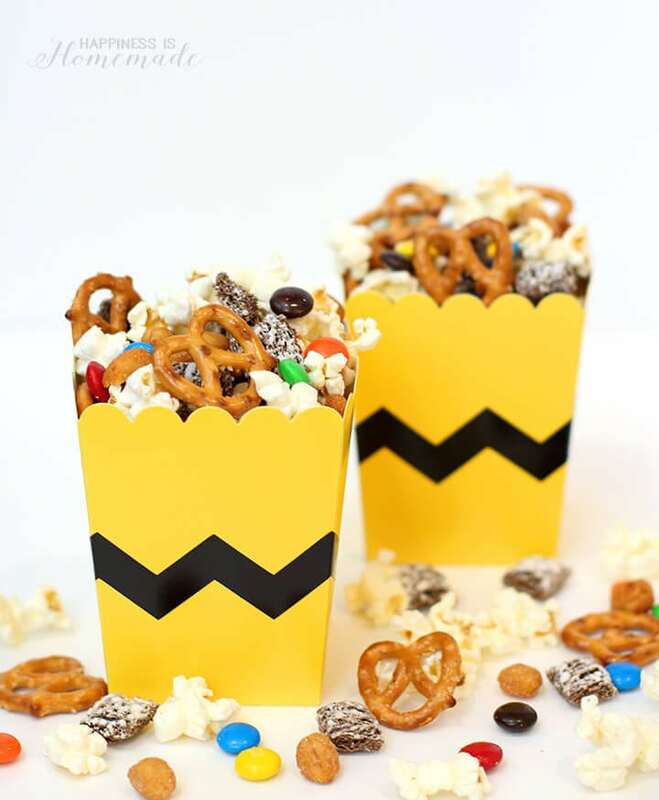 I had these cute yellow popcorn boxes leftover from Simon’s superhero movie party, and I knew they’d be perfect for our Peanuts snack mix. 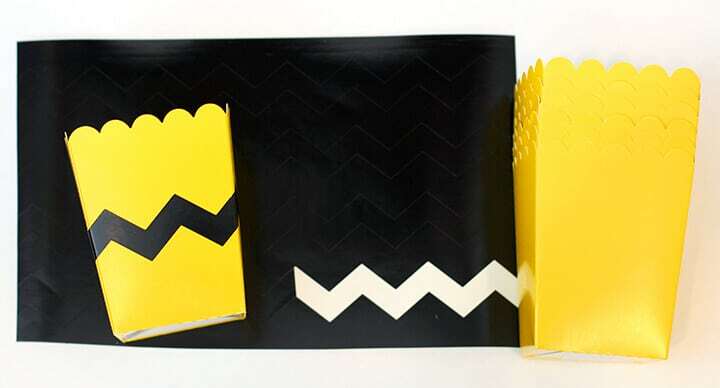 I used my Silhouette Cameo to cut Charlie Brown’s signature chevron stripes out of black vinyl, and stuck them on to the popcorn boxes. Easy peasy! I’d recognize those iconic stripes anywhere! I love the way that the colored M&Ms remind me of the different characters – yellow for Charlie Brown and Woodstock, red for Linus and Snoopy, blue for Sally and Lucy, green for Peppermint Patty, and orange for the Little Red-Haired Girl! 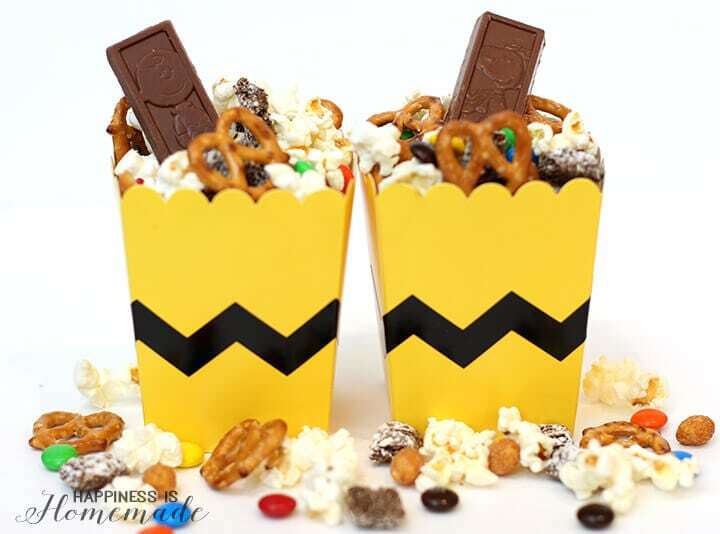 I topped off the snack mix with Nestle Crunch bars featuring our favorite Peanuts characters – so fun! 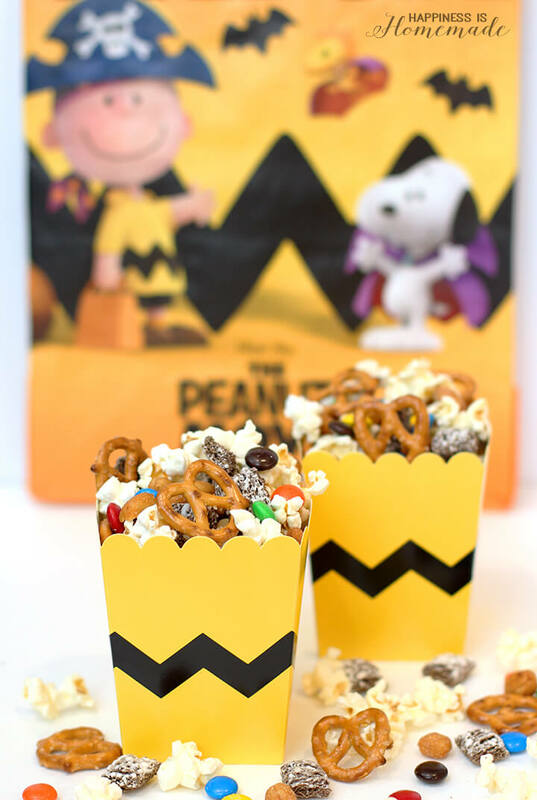 This quick and easy Peanuts movie snack mix is SO yummy, and that adorable packaging can’t be beat! Don’t forget to pick up your free trick or treat bags at Safeway while supplies last! 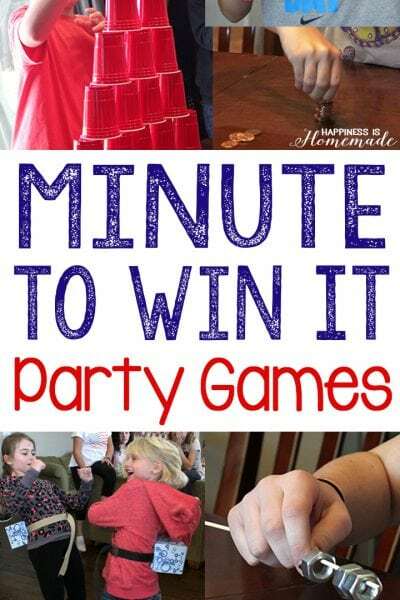 Love this party so much. 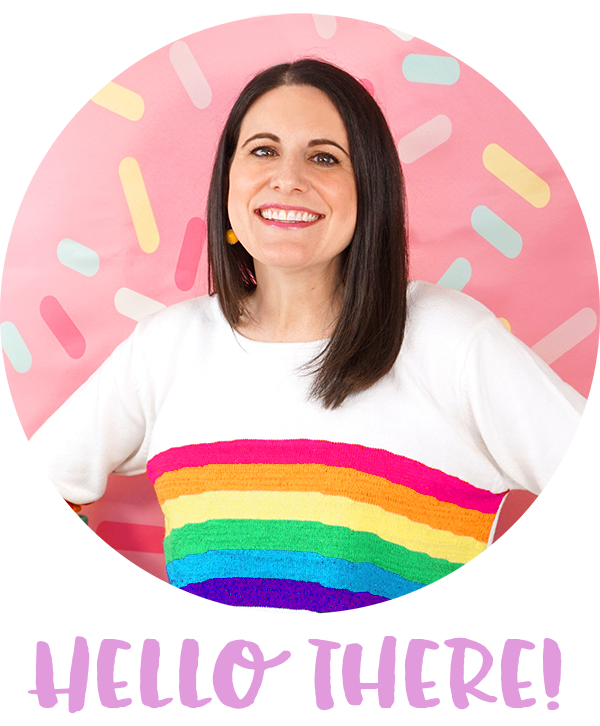 Is there any way you can share your chevron SVG cutting file with me? 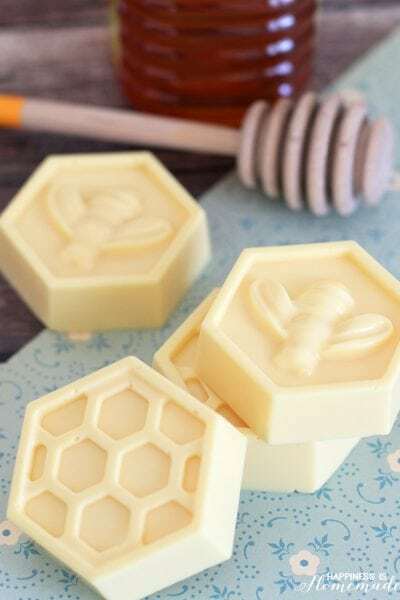 I am brand new to Sure Cuts A Lot (downloaded it yesterday), and I am having trouble converting a .jpg to an SVG, plus I am have a hard time finding a chevron file that is the perfect fit/thickness for the popcorn box. If you are able to share, it sure would be appreciated!